BluFast MX is hardware acceleration technology designed for Macgo Mac Blu-ray Player, which is developed by Macgo Team. It lowers Mac's CPU usage during playback; also the energy consumption is much reduced. Blu-ray and other video formats' playback is smoother than ever, and your MacBook can run more processes at the same time. What does BluFast MX do? This function reduces the utilization of CPU. For example, it may take 70-100% of CPU to play a BD when not using this; it may be reduced to 20-50% by enabling this feature. So you can do more stuff than just run a BD on your MacBook, and the playback will be smoother. Also, your MacBook won't be as hot as it used to be during playback. What's more, it reduces MacBook's energy consumption. It will take less energy to finish a Blu-ray Movie. How to turn it on/off? 1- Open "Preferences" under "Mac Blu-ray Player". 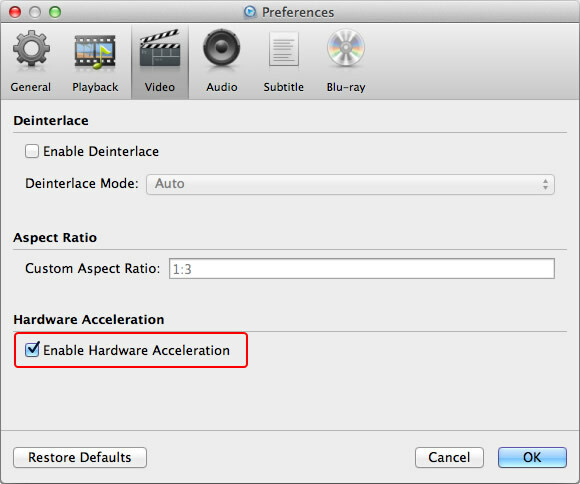 2- Find "Enable Hardware Acceleration" under "Video". 3- Check it and click "OK". Test Environment: iMac, Mac OS X 10.9. Samsung 6X Slim Blu-ray Writer USB External Drive. How's Macgo's hardware acceleration different from VLC's? A lot of users have heard of VLC's hardware acceleration. The first big difference is that Macgo's BluFast MX supports Blu-ray, besides other media formats. Also, this technology improves the support of many media formats, so the playback is more stable and fluent. BluFast MX is developed for Macgo Mac Blu-ray Player by Macgo Team.